When the game starts, it will show you some initial quests that serve as the starting tutorials. Your initial spawn area is protected, and you won’t be attacked by anything in it. So you are safe to stay around the area you spawned. I’m not sure exactly how big this is so don’t go to far! Try to complete all the quest while in this area, even the construction of the 3 blocks and placing the campfire. You won’t be able to take those with you, but it doesn’t matter. Just complete your quests here. But you will be able to take your bedroll, so take that one. It will be used later on your first "safe house”. The last quest that you will receive is traveling to a trader. And this is when you will move away from your starting area. As I said, this will be your last quest. As you start your trip, you will be uncovering areas of the map. Do not get distracted too much along the way, as you need to reach the trader and find a place to stay before the night comes. You can mark any place of interest in your map if you want to come back to it later. As you walk / run to the trader, loot any bird nests and trash you see along the way, but keep in mind to go as quick as possible. Time will go fast. When you reach the trader, part of the map will be now uncovered. Check it out and notice any roads or paths that you have uncovered. The trader closes its doors at night and you will be kicked out, so don’t think you can stay there at night! Once you reach the trader is time to get moving. You can come back to the trader later. Now we need to find your first safe location! Now it’s time to decide where to go from the trader. There’s really no correct answer here, as the map will be randomly generated. Your best bet is to follow a road in any direction. Sooner or later you will hit a town or city. Again, do not get distracted. Mark things on the map to come back later, but continue going. Your objective is to find the first city / town before it gets dark and zombies start running. The eventual looting of cars, trash and bird nests is ok. Also knock some trees down and pick some boulders on your way. You will need wood and rocks for some crafting during your first night! Once you find your initial town or city, you will need to choose a safe house. Every town will have different type of houses. The best ones to choose as your first safe house are the 2 or 3 story high buildings. These have an accessible terrace on the top, that can be reached through a wooden ladder attached to the a wall on the last floor. Beware as these buildings have sleepers on them. Enter them NOT through the doors, but through the windows, that are usually quicker to destroy. Try to kill the sleepers with arrows while sneaking to them. Clear any remaining zombies inside and head to the top. When you find the ladder to the roof area, remove the first block by knocking it out with your stone axe. This will prevent the zombies from climbing through it. You will still be able to climb the ladder by jumping. If you had luck, you will be on your first house by the end of the first day, when it starts to get dark. You should use the night time to stay safe in the roof area, crafting and organizing your inventory. You should now place your bedroll here. Also craft and place a campfire and some chests to store your loot and materials. Stay here crafting and checking out your stats and skill points at night. Day time will be to loot and collect resources. Now is time to focus on the preparations for your horde night. You will need a place where you can withstand the incoming horde relatively safe. I recommend a very simple 5x5 "tower” made of cobblestone, with a surrounding layer of spikes (2 rows if possible). To construct this you will need to collect lots of wood, rocks and, if possible iron. The iron you will get from picking the boulders and rocks at ground level, no mine is needed at this moment. While spending your nights at the rooftop, check the materials needed for crafting a forge. This is an indispensable workstation. If you can craft this one during your first 7 days it would be great. You will need several leather pieces, that you can get by skinning animals or breaking down leather chairs or sofas in town. Scrapping leather clothes too. You will need all that iron you get from picking boulders. Smelt the iron on your new forge, and start crafting the anvil. Once that is done you will have your forge ready to craft better tools and materials. Pay attention to your hunger and thirst levels. You can survive with berries during this time, but you will be terrible hungry and thirsty. Try to hunt any pig / deer you see. Also keep any can and glass jar you find and fill them in any close water source (lake, river, pond) from time to time. You will need this! If you are close to the snow biome, you will be able to craft potable water with snow, so do this instead. As I said, your aim now should be to build a 5x5 cobblestone tower. You will start by crafting the necessary flagstone blocks, and placing them in a 5x5 square in a flat location. I recommend doing this relatively close to your safe-house, so your trips back and forth are short. The streets are a good choice for this. This tower should NOT have any doors or window openings. Just a tower going up for 4-5 levels, so you stay out of reach from zombies in the ground. You will be using the wood frames as scaffolding to build and go up the tower when needed. No ladder, no stairs! Once you reached level 4 or 5 of the tower, use wooden frames to make a floor in the top. No need to upgrade them. You will be fine. Also add a "overhang” on the top level with the wood frames, extending one block, so you can stick out a bit from the border without falling. The frames will allow you to shoot through, so don’t upgrade them. The idea of this overhang is to be able to shoot arrows through it to kill the zombies that will be down on horde night. 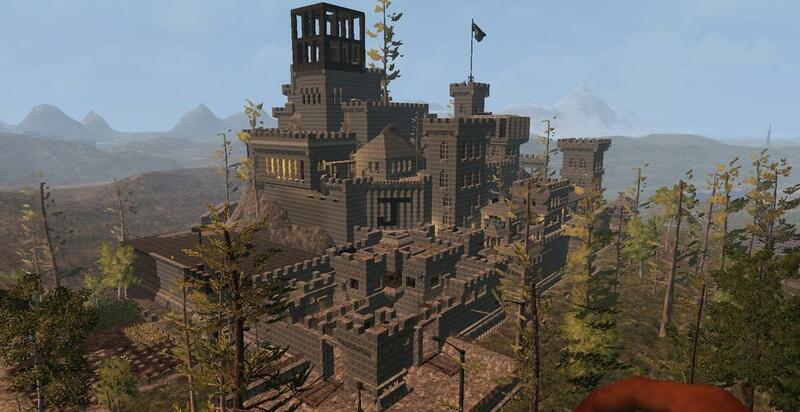 Now, it's time for you to craft and place 1-2 layers of spikes surrounding the tower. The big single spikes. You will need a lot of them, but they are helpful when the horde comes. If you can, upgrade the flagstone walls to cobblestone and the spikes one or two more levels (you will need iron for that). This will require more resources, and will keep you busy for the first 7 days for sure. UPD: I’m currently publishing a let’s play with my adventures on 7 days to die, and the same one used to make the video version of this guide. You can check it up here.